Just started using our Note 9 today, Voice mail app does not work, keep getting error message, is there an option for Visual Voicemail? Leaving messages from our landline, no notifications, have to call *86 to check for voice mails? Not happy with this voice mail thing, was much easier on Sprint to know if you had voice mail. Any suggestions on using voice mail on the Verizon Note 9? Really getting annoyed with this. Never used the app. I just forward calls to Google voice and use their voicemail system. It's free and works well for me. The voicemail app came pre installed on all of my Notes (back to the N3). I've subscribed to Visual Voicemail on VZW since before that. Once I sign into the installed vm app, it shows the full text conversions (i.e., Visual Voicemails). Hi... I have an unlocked phone I added to my Verizon account. All I had to do was leave a message for myself from another phone. The Samsung visual voice app was suggested when the message was detected and it works just fine. 9n VZW, you must upgrade your devices regular VZW voicemail to visual voicemail at 2.99 a month. 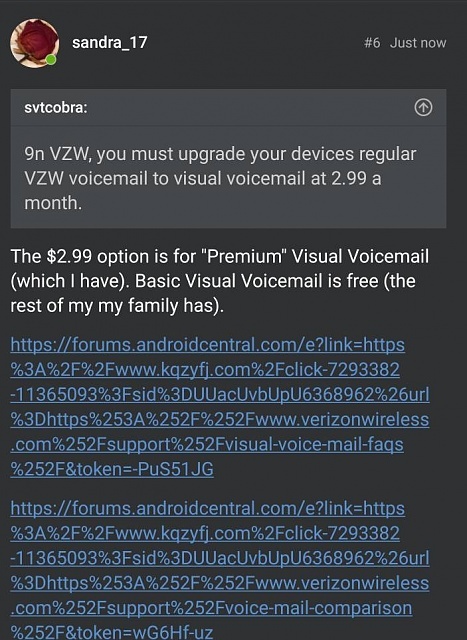 The $2.99 option is for "Premium" Visual Voicemail (which I have). Basic Visual Voicemail is free (the rest of my my family has). Does anyone know why the AC app does that to links? I wrote what's in the 2nd pic. I believe Android Central adds an affiliate link sometimes to sites so that they make money on certain sites. My visual voicemail on Verizon Note 9 works just as it did on my s8+. Phone will not hang up on 2 simultaneously answered calls.please advise. How can I recover my deleted Notepad PowerAPP notes?